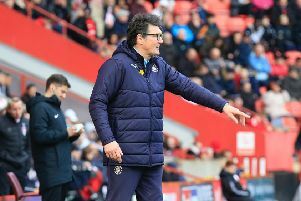 Luton Town boss Nathan Jones is expecting to have Danny Hylton, Jordan Cook and Scott Cuthbert available for selection when he takes his side to Cheltenham Town this weekend. Hylton was forced to sit out of Tuesday night’s 1-1 draw with Hartlepool due to a one game ban, while Cook’s tight hamstring restricted him to an appearance from the bench in the second half. Cuthbert had been stretchered during off the previous weekend’s 3-1 win over Doncaster Rovers, but could make a swift comeback, as Jones said: “Danny’s suspension is over, so he comes back into the fray, it’s nice to have him back as he’s an important player for us, an important member of the squad. “We’ll evaluate everything, but he’s one of the best in the league and we know that, that’s why he’s here. Defender Johnny Mullins isn’t expected to be fit though, after missing the midweek clash with a hamstring injury, as Jones continued: “Johnny’s probably going to be a bit longer, we won’t take any risks, that’s the benefit of having the squad we have, that we don’t do that. Glen Rea will also sit out the trip to Whaddon Road as on his progress from knee ligament damage, Jones said: “He’s a little way off at the minute, we’ve integrated him little by little, but it’s an injury we thought was going to be four weeks. “It’s only been not far off two weeks, so he’s integrated back into training, but steadily. Should Luton be hit by anymore injuries though, Jones is confident he has the squad to cope, particularly with such impressive full debuts recently for academy graduates James Justin and Akin Famewo. He added: “The young ones who have come through the ranks here are exceptional youngsters. “We’re probably holding them back if anything, in terms of giving them an opportunity. “The opportunities come and they’ve taken them, they never let us down, they actually take their opportunities and add to the team so it’s no problem. “We have some top level youngsters here, we don’t purposely say we’re going to have a young team, it just works out like that.